As one of the worst kept secrets in the industry, John Deere’s new 9000 Series self-propelled forage harvester range finally breaks cover. James Rickard gets under its panels to find out more. 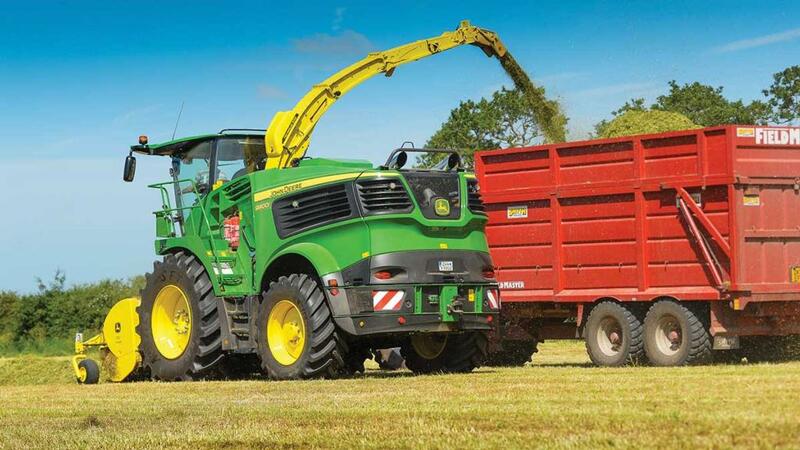 Featuring new engines, a new flagship model, uprated drivelines along with fresh model numbering and styling, it is fair to say John Deere has been busy updating its range of wide body self-propelled foragers. Headline-grabbing news is the introduction of a new top model, which sees JD’s chopper range extend to 970hp. This puts it on the shopping list of those contractors considering large output machines for power-sapping jobs such as maize and whole crop rye harvesting. The more powerful forager offering is also a reflection of the changing trend towards larger foragers, simply to get things done in less time, suggests John Deere. As before, the JD forager line-up consists of a range of narrow body and a range of wide body machines. To now differentiate between the two, the firm has designated the larger models the 9000 Series, along with new styling to give them a visual difference. Six models make up the new Series from 625 to 970hp (see panel), with full production starting in October. To get a flavour of the updates, we tried out a 9800 machine in some heavy first cut Cheshire grass. One of the most substantial changes to the forager is the switch from Cummins engines, in the previous top two models, to the use of Liebherr motors for the three largest new models. While the required power levels could have been met with the venerable six-cylinder Cummins unit, it did not conform to the upcoming emission standards, required for Stage 4 in 2019. Deere adds at higher power levels, the Cummins engine also could not produce the desired engine characteristics. Having weighed up several options, including the use of two Deere engines (a nine-litre and a 13.5-litre unit), it was Liebherr’s low-revving engine concept which ticked JD’s boxes. 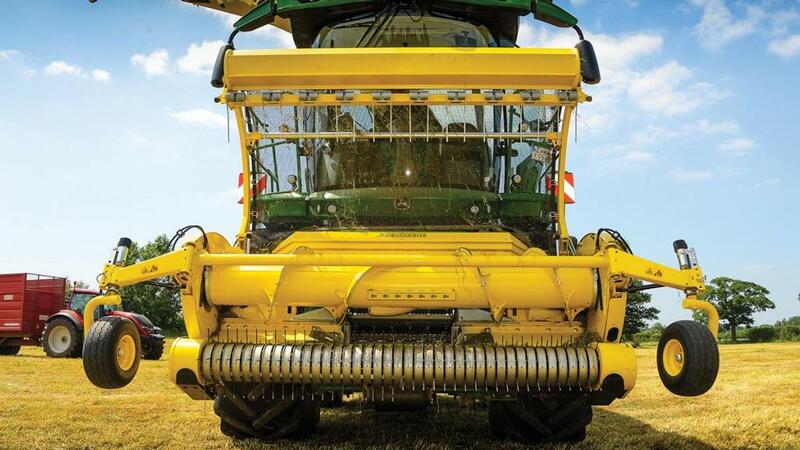 On top of this, the engine can be easily tuned to meet the requirements for a forage harvester, says Deere, and it allows the ability to increase power should the need arise in the future. While badged up as Liebherr, the main engine block is actually a MAN unit with a Liebherr head. Constant power is available from 1,400 to 1,800rpm, with peak torque achieved at 1,350rpm. Torque levels are significantly higher than its predecessor, offering a notable improved tolerance towards peak loads. As we found, it really is an engine you can lean on with a sweet spot between 1,300 and 1,600rpm, which in turn gives confidence to push on knowing the forager’s engine performance is not suddenly going to drop off a cliff. 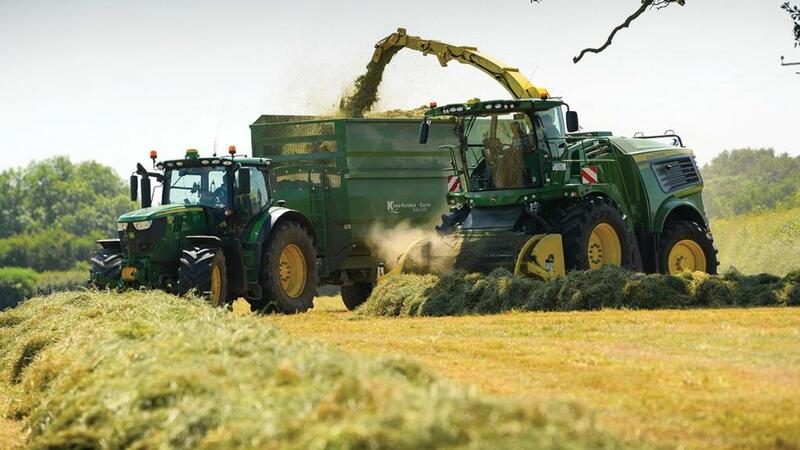 But while not a match on paper for the likes of Krone’s BigX 1100 power levels, for example, John Deere claims it is the overall efficiency of its flagship, and how it uses the power, which enables it to compete with others on the market. To make maintenance easier, service intervals for the engine are up to 1,000 hours. And Stage 4 compliance comes courtesy of selective catalytic reduction using AdBlue. Though the driveline of JD’s wide body foragers was future proofed from day one of design to handle more power, up to 1,250hp, a new gearbox and driveline was still required to handle the low-revving, high torque characteristics of the Liebherr power plant. This has seen JD develop a whole new gearbox to transfer power from the engine to the chopping cylinder. 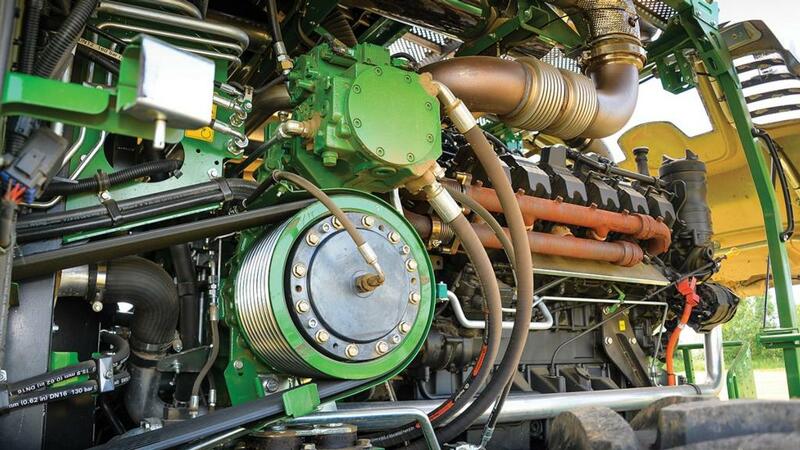 Unlike Claas and Krone which mount their engines transversely, with power taken directly from a pulley to the chopping cylinder, Deere says its longitudinal engine layout affords the ability to match the engine better to the needs of the forager, via gearing. This means the engine can run in its ‘sweet spot’ and not a compromised higher rpm, though some would argue that the use of a gearbox actually saps a certain percentage of power itself. In addition, the belt from the gearbox to the chopping cylinder is now a nine groove item, previously seven, as is the kernel processor drive. Header drive has also been beefed up with a larger hydrostatic drive and fatter shaft dimeter and bearings. To increase throughput, speed of the chopping cylinder for the top three models has increased to 1,350rpm at rated speed, previously 1,200. This puts it at an almost 1:1 ratio with the engine speed, during certain points in the rev range, and offers a 13 per cent throughput increase. Claimed to offer better stone protection and set-up flexibility, though you might be a while setting it up, the forager’s multi-blade chopping cylinder availability extends to 40, 48, 56 and 64 knife options. Its shafts and bearings have been uprated, as has the crop accelerator’s, and it features more bracing within the cylinder. Complimenting this is a beefed up mounting for the sharpening mechanism. Up front, Deere continues to stick with four compression rollers, rather than six as Krone and Fendt have done, citing it can still achieve the require crop compression and it affords much better access to the chopping cylinder, with the feed roller housing simply swinging out of the way. Feeder house frame is now thicker. To match the power, JD’s 639 Premium grass pickup features reinforced tines, cam track and drive lines, along with ‘hard’ metal replaceable wearing parts around the throat and the edge of the auger’s flights. It also gets a split pickup reel, allowing a centre support bearing to be fitted. Retaining the same wheelbase, the chassis has been slightly adapted. New engine mountings have been developed to offer a lower centre of gravity, while more space has been made for stronger drivelines. 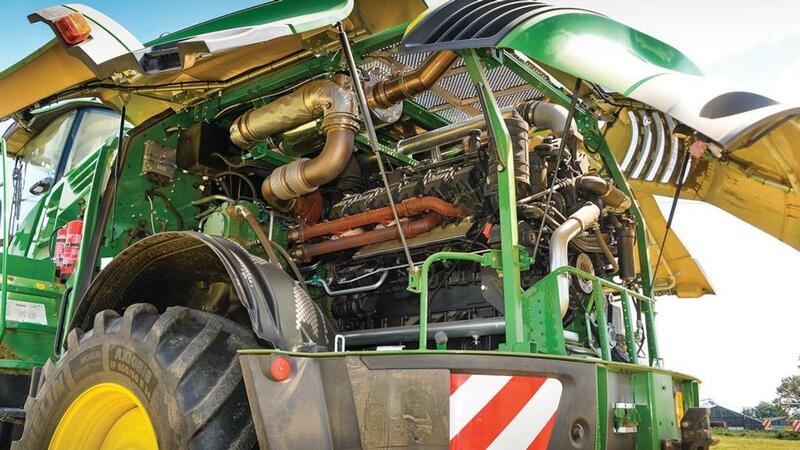 Deere says it experimented with mounting the engine transversely, but this raised the centre of gravity and required much more cooling. As it is, cooling capacity has only had to increase slightly, and the engine can be mounted right at the back of the forager for better balance. A bit of re-jigging sees fuel tank capacity boosted to 1,500 litres, previously 1,100 litres. The new diesel tank design is evident by the new cab steps’ layout which now take on a spiral arrangement. Wheel equipment sees 800 front tyres offer a transport width of 3.3m, while 900s push the forager out to 3.5m. At the rear, Michelin now offers IF 650/60 R34 tyres – previously, only Trelleborg did this size. This allows a higher load rating at lower pressures. John Deere has added a new top model to its 8000 Series narrow body foragers, designated the 8600, and not to be confused with the old wide body 8600 which is now the 9600. With 625hp, it offers a certain level of overlap within JD’s forager range, which now includes six, 8000 Series models from 380hp. Developed by JD-owned company Kemper, Deere has introduced a new maize header featuring six ‘large’ drums. The 12-row header is said to be suited to high yielding crops. It also folds for transport within 30 seconds. Finally, John Deere has extended its range of kernel processors by introducing the XStream KP model. Developed with the US-based company Scherer, it provides a large roll diameter of 250mm and 50 per cent roll speed differential, increasing processing intensity by 10 per cent at all cutting lengths, says the manufacturer. Kernel processor rolls are available with a standard saw tooth design on the Premium KP unit, and either the saw tooth or a new XCut design on the XStream KP, which features a spiral cut groove across the roll surface.